Hercules, oratorio, HWV 60: Where shall I fly! George Frederick Handel. Very Good. In very good packaging. 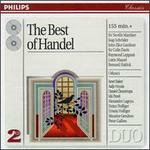 The Best of Handel.